Staccato claims these are the loudest drums ever made. They need to be to justify carrying around that massive bass drum! The bass and floor tom are unquestionably deafening, but we're still not sure about the smaller toms. They have impact, but their lack of resonance is disconcerting. The drums are beautifully finished as you'd expect from a manufacturer steeped in the custom bike/motor trade, and that's the clue really. This kit has a super loud bass drum and the most amazing wow factor. The lack of resonance on the smaller drums will not suit some players. 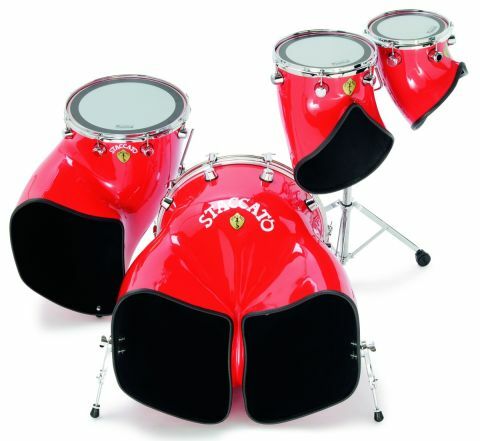 Staccato drums first appeared in 1977. They were designed and hand built by British artist/inventor Pat Townshend, who says the idea came from a painting of a tree that he once did. With the bright red fibre glass and Staccato badge, the look is also reminiscent of a Ferrari. Which is hardly surprising since Pat, as well as being a musician, has long been involved with motorbikes and cars, both racing them and working on designs and inventions. In the'70s, drum manufacturers tried out allsorts of synthetic materials and fibreglass North drums from the USA hit the headlines when they were played by Billy Cobham, the leading drummer of the day. Staccato took the North idea further. North drums had an alpine horn shape while Staccato shells are more complex. The bass drum in particular has even been likened to a pair of clown's baggy trousers. Unsurprisingly, the original Staccatos got loads of attention. They were launched at the Red Lion pub in Fulham with none other than Mitch Mitchell at the helm. John Bonham and Keith Moon also used them and Nicko McBrain and Chris Slade (Robert Plant's drummer) were both involved in the original company. Staccato's history, though, is as convoluted as the drums. Suffice to say production ceased around 1984 as drum machines took over. Pat Townshend decided to give Staccato another go. The relaunched drums are made in exactly the same way as the originals. The standard shells are made from multi-layered glass reinforced plastic (GRP/ fibreglass), but Staccato also offers two further options in more expensive, lightweight carbon fibre. The first has a similarly impregnated colour finish to the fibreglass drums. The second is a "gloss transparent finish that allows you to see the holographic effect of the carbon fibre weave". This is the same effect sometimes seen on Formula One cars. Carbon shells don't come cheap. Small toms cost 50 percent more than the fibreglass models, while the bass drums are almost three times more expensive. Mind you, the carbon drums are also said to be 40 percent louder than the fibre glass, so you're getting plenty of extra volume for your money. The review kit is in standard fibreglass and each shell is reinforced at the stress points, making it virtually indestructible. The original Staccato lugs were Haymans and the ones fitted today are similar but slightly conical. Standard finishes are white, black, yellow, red and blue, but since the drums are hand built you can also choose from more than 100 custom finishes at a nominal extra charge. Custom artwork is also available.The colour is impregnated in the drumshell so it can't scratch or chip off, and shallow marks can be polished out. The toms come in 6" to 16" diameters. The review kit had 10"and 12" mounted toms and a 16" floor. The mounting brackets for the two small toms were on the back of the drums rather than the side. This made setting-up on the accompanying Gibraltar stand a bit awkward, but the brackets can be mounted wherever you ask. The 16"floor tom has two stabilising legs, but unfortunately, because of the curve of the shell, the legs angle inwards instead of out. Still, the front end sits on the floor and is stable enough. Pat is trying to find longer legs to mount higher up the shell, or he may simply try bending the legs outwards. A single 22" bass drum completes the kit. It is, however, an incredible 29" long, and 29" wide at the mouth. It's surprisingly light, so lifting it is not a problem, but transporting might be, not to mention trying to fit it on to the usual cramped pub stage. At 4mm the shells are pretty thin, although they increase to 8mm around the tops where the hardware is mounted. The bearing edges are formed by turning the lip over and in. They are rounded, not sharp, and they mirror the curve of a Remo head collar. The outer front edges are bounded with a heavy braid, similar to the kind you would find around car door seals. Inside there's a furry, fibrous finish which is actually a fine-strand fibreglass fabric called 'surface tissue'. This can be finished in any contrasting colour you like. It actually came about at Simon Phillips' request after experiments back in the'70s. The kit looks amazing, but what about the sound? The shells are open-ended horns, bent and twisted so the sound projects forward rather than down, as with conventional single headers. The first thing to say is that single-headed drums always have more impact but less tone than double headers. Even so, our first impression of the small toms was that they lacked resonance, while the 16" and kick by contrast had massive presence. A kit of two halves you could say. The sound of the small toms has clout but not much in the way of body- there's a blat, but no boom. It is however extremely clean. We're sure they would mike up a treat, with mics aimed inside. Choice of heads is crucial. A thinner head will give more resonance, but this must be weighed against the fact the drums will probably be played hard. Remo CS blackdots worked well - they were lively but tough. So from behind the kit the smaller toms felt dry, while the 16" and bass drum had more breadth. But out front the small toms do come across better. The fibreglass accentuates the deeper frequencies, which carry further, and all the drums have a fantastic low end. The bass drum is without doubt one of the loudest we've ever heard. Standing in front of it while someone else wallops it is not recommended! Something about the shape of that massive double chamber really does amplify the beat. Thunderhorn is truly the right name. What's for sure is that the Staccato sound is unlike any other. You might not be keen to start with, but once you get used to it, you'll see it might be perfect for metalheads who like that ultra-deep, slappy sound. Loads of impact and attitude with a dark, thunderous kick. Just make sure you try them thoroughly before committing your cash.